THOUGHTSKOTO Thoughtskoto : How To Get A Loan Through An Online Loan Marketplace? How To Get A Loan Through An Online Loan Marketplace? Many Filipinos patronize a wide-spread illegal lending scheme which collects high-interest rates and rendered by private individuals, mostly to small merchants and vendors. It is commonly known as "5-6". President Rodrigo Duterte has expressed bad taste towards "5-6" and he wants it to stop because it buries poor people in neck-deep debts and hardly gets away with it. They will continue making loans to pay the other loans. 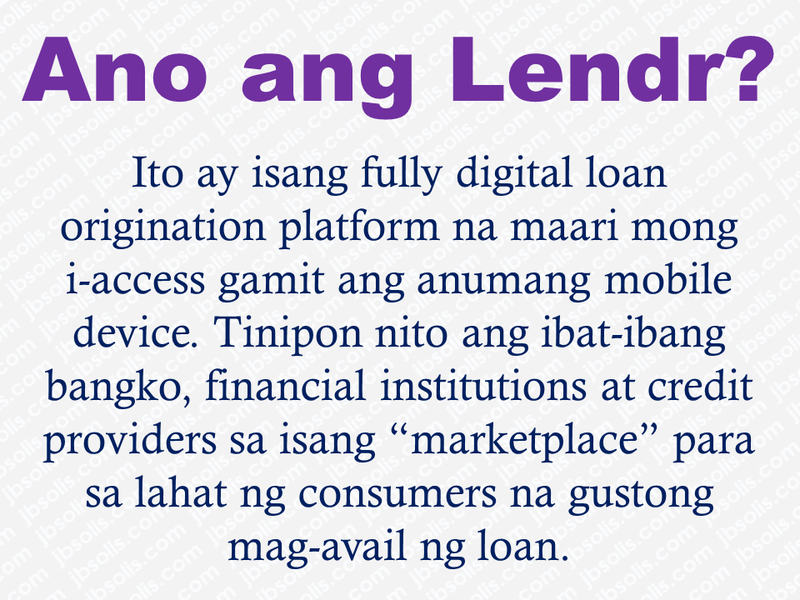 In this accord, bankers and financial institutions, in their way of helping the government make its citizen free from "5-6", they created a loan marketplace where Filipinos can find their immediate solution to financial problems and by referring others, they also have a chance to earn through KasamaKa and Lendr. 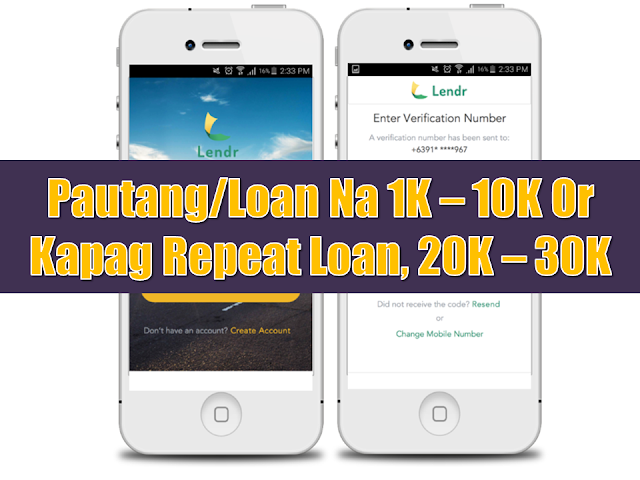 Lendr is a fully digital loan origination platform that you can access using any mobile device. Lendr aggregates different banks, financial institutions and credit providers into a single “marketplace” for all consumers wishing to avail of loans. You can now “shop” and compare the different loan products via the Lendr Loans Marketplace. You can directly apply for your loan, submit your loan requirements and get approved by your preferred Lendr Partner Bank via the Lendr app or website. No need to go through all the hassle of going to bank branches and waiting for long and tedious loans processing. You can also manage your active loans, monitor loan balance, payment progress and view your amortization schedule using Lendr. Lendr is your one-stop loans shop to apply for your desired loan products from our partner banks via our Lendr Marketplace. From our website at lendr.com.ph simply create your Lendr account and profile. Once created, you may now choose the type of loan you want to avail and “shop” for your preferred loan offering. Last step is to filling in the appplication details together with all the documents required by your chosen partner bank to apply for your loan. The Partner Bank processes your loan (subject to bank’s processing time) and the bank’s credit evaluation. You will be notified thru SMS and inside your Lendr account. How do I create a Lendr account? Simply go to lendr.com.ph and click the SIGN UP button. Once in the log-in screen, click “Create Account”. Fill-out all the required information. Once done, you already have your all-in-one Lendr Account. Go to lendr.com.ph and click the SIGN UP button. On the sign up page, enter your mobile number then click “Submit”. A verification number will be sent to you via SMS. Enter the verification number then click “Verify”. Upon verification of your mobile number, fill the necessary fields in the Lendr registration form. Click “Agree” on the Lendr Terms and Conditions and Data Privacy, then click “Create Lendr Profile”. What is a Lendr Profile? The Lendr Profile is where your Personal, Employment, and Financial Information are gathered for one time fill-up. With the Lendr Profile, you won’t have to fill out applications again and again as the form will automatically be filled with your profile. Can I apply for a loan without updating my Lendr profile? No. The information in your Lendr Profile is used for your loan applications and as such, must always be updated to ensure the accuracy of your information upon application. Having an outdated Lendr Profile might cause trouble in your loan application resulting to prolonged loan processing. What kind of device do I need to access Lendr? The Lendr Platform can be accessed through any mobile device such as Smart Phones, Laptops, Tablets, and desktops for as long as they have internet connection. It requires Google Chrome (version 48+) browser. What kind of loan products can I apply with Lendr? What is the Lendr Loan Marketplace? The Lendr Loan Marketplace is where you can “shop” for different loan products offered by all the Lendr Partner Banks. You can search for your preferred loan product based on the most competitive interest rates, longest payment terms, active promos, or the bank nearest to your location. Should I still go to the bank if I apply via Lendr? No need to go to the bank during loan application via Lendr. However, after submitting your application, the Bank may require you to visit their branches during credit evaluation or during the release of your loan, depending on your preferred loan release method. How is the application process in general? 2. Click the SIGN UP button found at the Top Menu, to Create your Lendr Account. 3. Choose the type of loan that you would avail and choose the best loan product offer for you inside the Lendr Marketplace. What is Lendr’s Terms and Conditions? What SIM cards can I use to register for a Lendr account? Only SIM cards issued in the Philippines can be used to register (SMART, Talk ‘n Text, Sun Cellular, Globe/TM). For those who will work (OFW) or travel abroad, activating international roaming before registering to Lendr is necessary. What are the requirements for a loan application? All these requirements can be fulfilled via the Lendr Platform. The maximum amount you can loan is dependent on your monthly salary. Take note that each bank has different calculations on how many loans will be granted per customer. You may be granted a higher or lower loan amount that you applied for. The loan you will borrow depends on the value of the asset (Car, Condominium, Land, House, etc) minus your preferred downpayment. How long are the payment terms? The payment terms available differ per bank and the loan product you are applying for. It can be as short as 3 months or as long as 60 months. It is up to the client to choose his or her preferred loan terms. How does the Loan Calculator work? The Loan Calculator is used to estimate your monthly payment depending on your loan amount and loan term options. You can tweak the amount you are going to loan and how long you are going to loan it. Once you are satisfied with the estimated monthly payment, you can proceed to the next part of the loan application. Note: The monthly amortization displayed in the loan calculator is indicative and is still subject to other fees and charges of the bank. I want to change something in my Loan Application but I can’t edit the fields? As the information in the Loan Application is based on the Lendr Profile, the only way to change the fields during a Loan Application is to go back to the Lendr Profile page and update your information. This is to prevent conflicting information in your Loan Application form and the Lendr Profile. You can either scan the documents or take a picture with a clear camera. Please make sure that the images are clear and readable to have higher chances of getting your loan approved fast. What are the Bank Agreement Documents? These are documents required by the bank before you can submit your loan application. With Lendr, you don’t have to go to the branch to personally sign the documents. Such documents might include, but not limited to, Loan Disclosure Form, Amortization Schedule, and Terms and Conditions of the loan. The E-Signature signifies your agreement with the terms and conditions of and all other bank agreement documents show to you during your Lendr application. How do I follow up an Application? You may follow up an application by contacting the Partner Bank’s Customer Support directly for Loan Applications. How do I know the status of my Loan Application? Using the Lendr Platform and your Lendr Account, you may be able to monitor the progress of your loan application by going to “My Loans”. There, you’ll see the current status of your Loan Application. SUBMITTED – Lendr Loan Application Status signifying that the application has been submitted by the borrower. IN PROGRESS/IN PROCESS – Lendr Loan Application Status signifying that the application is currently being processed by the FI (financial insitution). MORE_INFO – Lendr Loan Application Status signifying that the FI requires additional information that the borrower must supply before the application will be processed by the FI. DROPPED – Lendr Loan Application Status signifying that the FI has decided not to process the Borrower’s application after assessment. WITHDRAWN – Lendr Loan Application Status signifying that the Borrower has withdrawn his application prior to having it approved by the FI. REJECTED – Lendr Loan Application Status signifying that the FI has disapproved the loan application after assessment. EXPIRED – Lendr Loan Application Status signifying that the application has expired due to the Borrower not Accepting the approved loan offer from the FI within a stipulated time. ACCEPTED – Lendr Loan Application Status signifying that the approved loan offer by the FI has been accepted by the borrower. DECLINED – Lendr Loan Application Status signifying that the approved loan offer by the FI has been declined by the borrower. BOOKED – Lendr Loan Application Status signifying that the application has been recorded in the FI’s internal systems as part of the FI’s loan portfolio. RELEASED – Lendr Loan Application Status signifying that the loan proceeds has been released to the borrower. PAID-OFF – Lendr Loan Application Status signifying that Borrower has paid off all amortizations due for the loan account. Can I apply to multiple banks? Yes, you may apply for multiple loans via different partner banks all at the same time. Please take note however that approval will be dependent on each applied banks’ credit evaluation. Withe KasamaKA and Lendr, you will no longer need to resort to illegal loan schemes. You may now solve your financial problems doing legitimate transactions with banks and financial institutions with a chance of having an extra income if you are already a registered community builder.